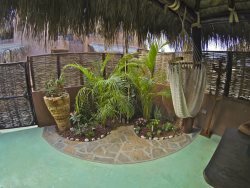 First floor location, with palapa covered front porch. Perfect get away for 2 on a budget. Short walk to the beach. Great community pool and hot tub. Restaurant on site during high season. Other eating opinions close by. This unit has a very basic set up, but everything you need to a low budget trip!